Cisco's ASR 5500 mobile packet core will help make networks more intelligent and allow operators to charge differently for various types of content. NEW YORK (CNNMoney) -- By 2015, more people will access the Internet from mobile devices than from conventional PCs. A year later, in 2016, 19 billion devices and gizmos will be connected to the mobile Internet -- not just your smartphone and tablet, but your washing machine, cars and clothes will be connected too. That's a giant problem for wireless carriers, which are already struggling to keep up with surging data demand. Trying to innovate their way out of the crunch, the industry is using new tools and tricks to optimize every bit of infrastructure. Cisco (CSCO, Fortune 500) added a key piece to the puzzle on Tuesday, releasing a new tool that will let carriers sift through and prioritize the traffic flooding their networks. It sounds pretty geeky -- "mobile packet core" product launches don't inspire iPhone-like frenzies -- but this back-end upgrade has some significant implications for everyday users. The problem: Everyone has experienced the frustrating effects of wireless network congestion. Your video buffers forever, a website takes minutes to launch, or you can't get Google Maps to load when you're late to a meeting and don't know where to go. Much of that pain comes from the way that today's networks give more or less the same priority to all kinds of traffic. Ads running on Angry Birds are treated the same as a Netflix (NFLX) video -- not a good thing, if a bunch of ads on other people's phones are causing your movie to stall. The user experience would be noticeably better if the network were able to speed up streaming video at the expense of a slightly slower load time on an ad in a game. The typical wireless network doesn't know how to do that. 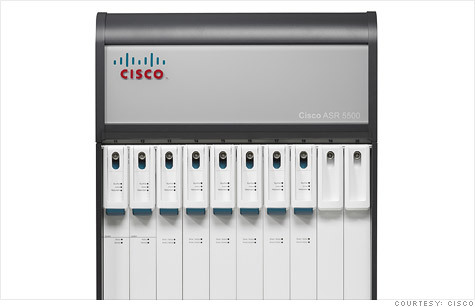 The solution: Cisco thinks it has a fix with its new ASR 5500 mobile packet core. It's a kind of gateway between the mobile network and the larger Internet that gives networks the intelligence to handle different traffic differently. Verizon, for instance, could set different priorities for video services, phone calls and apps -- particularly during peak download hours -- to ensure that all services run as smoothly as possible. That way, Netflix or YouTube videos might not get interrupted if Verizon makes websites take a second longer to load. Verizon, along with Indian telecom Bharti, announced Tuesday that it would be among the first to deploy the ASR 5500. The ASR 5500 isn't the first intelligent mobile packet core: Juniper (JNPR), Ericsson and a handful of startups have released similar products. Where this is going: If carriers can prioritize different types of traffic differently, they can also charge different rates for them. That's a major shift from how things run today -- but it's a slippery slope we're already on. Cell phone companies like Verizon (VZ, Fortune 500) and AT&T (T, Fortune 500) have instituted tiered pricing models, making users pay for each gigabyte they consume. That leads to a pretty lousy experience for people who watch a lot of videos, which gobble up megabytes. If Netflix and Google's (GOOG, Fortune 500) YouTube are the main culprits for network congestion, why not charge differently for those services? Cisco's on board. "This technology gives operators the intelligence for optimizing and monetizing their networks," said Kelly Ahuja, head of Cisco's mobile Internet technology group. It's an idea AT&T and Verizon are quietly but actively floating around, according to Ken Rehbehn, an analyst at Yankee Group. One hypothetical option might be to have Netflix pay the cell phone companies for its customers' usage. Verizon and AT&T would then not count that traffic against their own customers' monthly data allotments. This gets swampy fast. For example: Verizon is working with Redbox to develop a streaming video service that is widely expected to go head-to-head with Netflix. Verizon could score a clear competitive advantage by letting its customers stream videos from its own service without counting them against their monthly data cap. Verizon, which is publicly backing the ASR 5500, declined to talk about that aspect of the technology. It stuck to a prepared statement blandly praising the new platform as an upgrade that "will help serve our needs for scalability and agility." Intelligent networks are clearly the wave of the future: We've already got more things connected to the Internet than we have people on Earth. Now get ready for the battle over how we'll pay for the data all those gadgets are consuming.